A popular way to strengthen and stabilize a trench is the beam and plate method. Below is a quick look at how this option works. 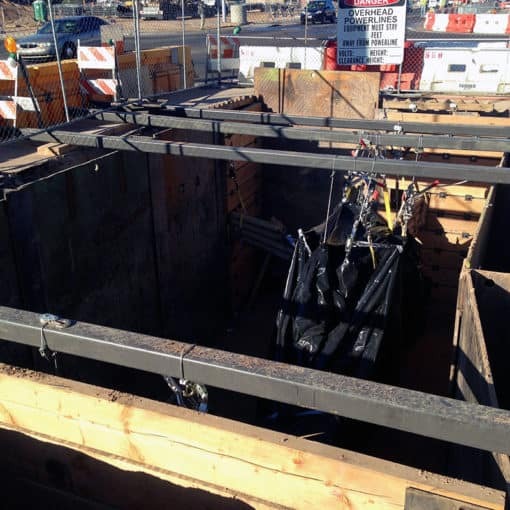 Large steel beams, commonly called I-beams, are first driven into the ground in the area that needs to be stabilized. These beams are strategically placed to allow workers to access the area that needs to be worked on, while offering dependable protection and fortification. Once these are in place, steel plates are slid over the top to create a platform for additional support and reinforcement. Why use the Beam and Plate? The beam and plate method is most commonly used when there is a large project that is going to span a longer period of time. While it may take a little more time and effort to put into place, it will provide incomparable support throughout the duration of the project. Trench Shore Rentals is a professional shoring equipment supplier not only offers high quality products at competitive prices, but can also provide workers with expert opinions regarding the various shoring methods available. If you are beginning a lengthy project that is large in scale, it may be in your best interest to rent the equipment you need to build a beam and plate shoring system. Contact Trench Shore Rentals to learn about the wide selection of beam and plate shoring equipment we have available for rent or sale. Call (602) 253-3311 now. Great price on the beam and plate equipment we needed for a longer project recently. Very happy with the training and reasonable pricing.